NYFW is in full swing and today(February 8th) Kiki Layne, Maggie Gyllenhaal, Julia Jones, Julia Garner, Angela Sarafyan and Sadie Sink were front row at the kate spade new york Fall 2019 runway fashion show at Cipriani. 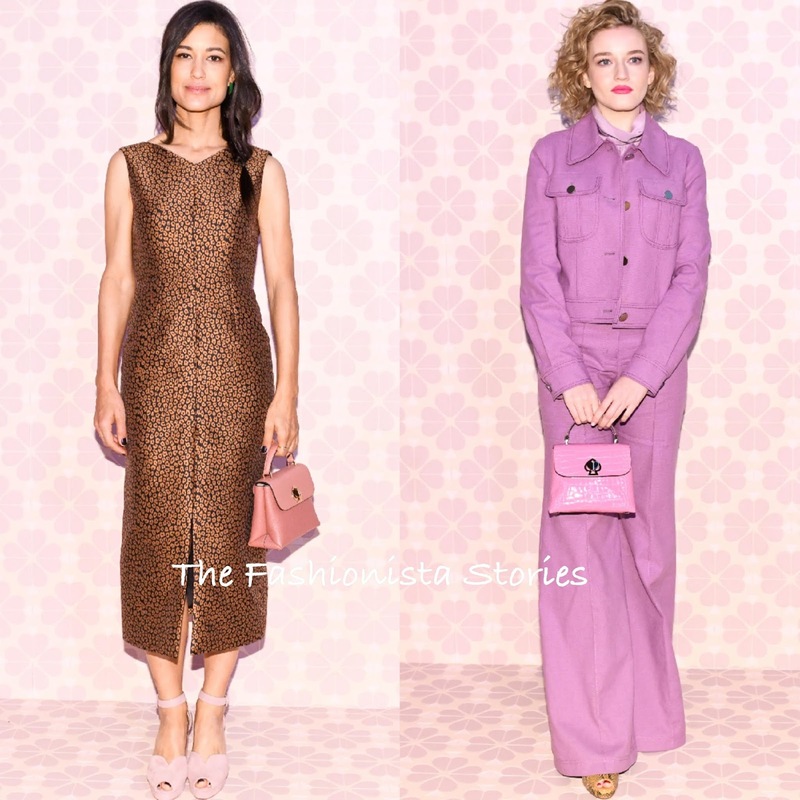 They were all wearing KATE SPADE NEW YORK FALL 2019 pieces. Kiki Layne was right on season wearing a silk button back blouse in golden raisin, satin ruffle midi skirt in candied fig, the 'London' boot in bronze metallic leopard crinkle, the 'Nicola' metallic haircalf small flap shoulder bag, and the 'under the sea' tulip shell stud earrings. Maggie Gyllenhaal showed a little midriff wearing a power suit in red jasper, with a black crop top underneath, the 'Paris platform sandal in cherrywood snake, and the 'on the dot' studs in tortoise. Julia Jones went the sophisticated route, wearing a floral leopard jacquard midi dress in black, the 'Paris' platform sandal in dried rose suede, half moon scallop studs in green, and the 'Romy' mini top handle in blustery pink. Julia Garner went the retro inspired route, wearing a purple basil heather basketweave jacket and pant, a silk button back blouse in purple shade, the Romy croc mini flap top handle satchel in berry blitz, and the 'Paris' platform sandal in marigold snake. 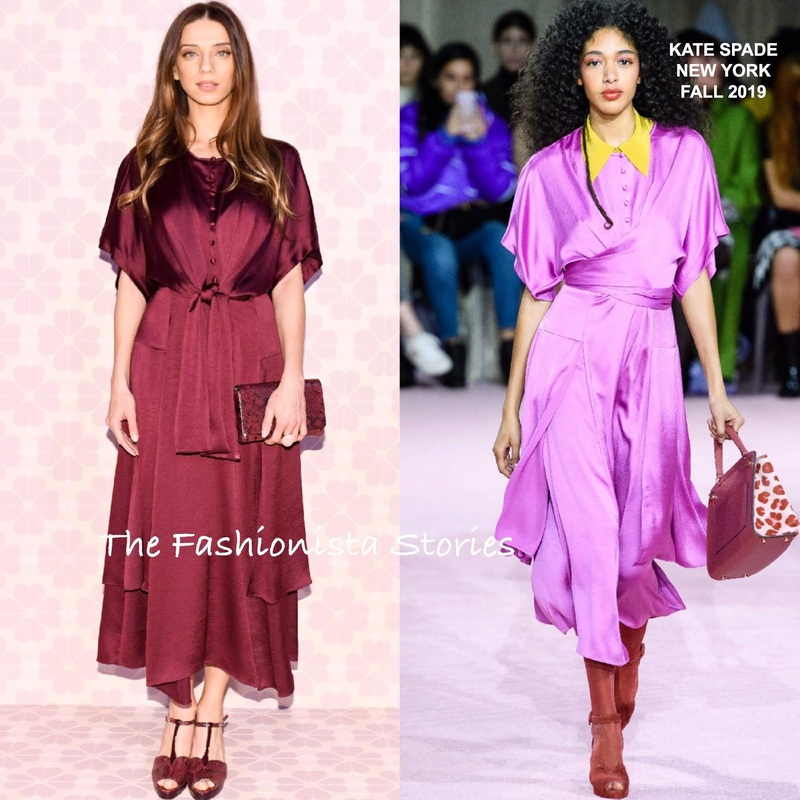 Angela Sarafyan wore a tie front satin midi dress in candied fig, the 'Nicola' snake twist lock chain shoulder bag in cherrywood, the 'Paris' t-strap platform sandal in cherrywood, and the resin ring in pink. I really like the lavender hue that the dress was shown in on the runway but Angela's hue is on tune with the season. Sadie Sink's look made it's debut on the runway today but in a different color-way. 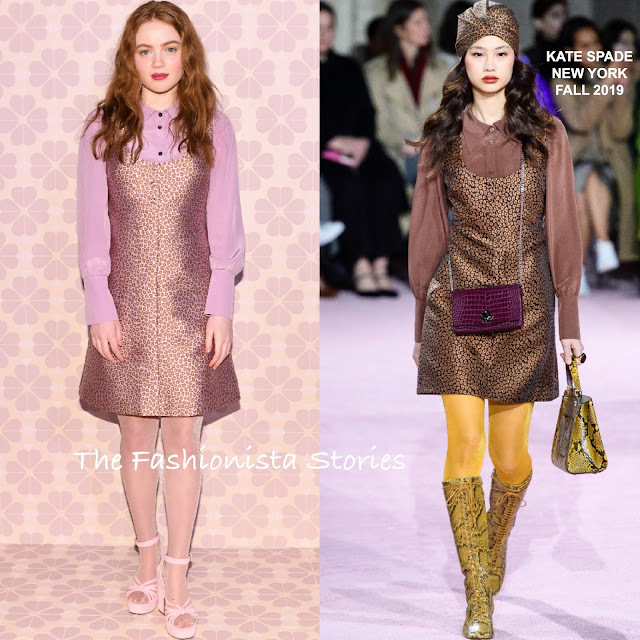 Her ensemble featured a printed shift dress with an purple silk button back blouse underneath, and the ‘Paris platform sandal in marigold snake’.